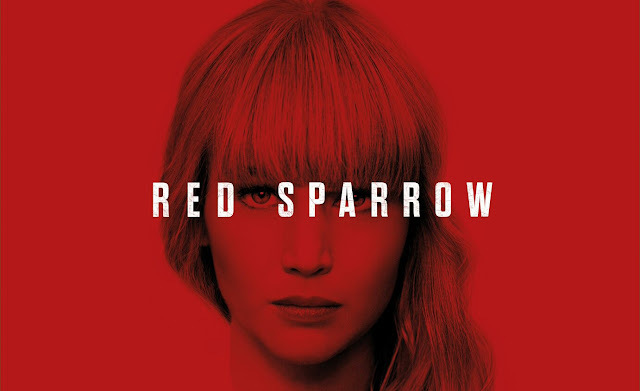 Read Mind on Movies review of Red Sparrow. When she suffers a career-ending injury, Dominika and her mother are facing a bleak and uncertain future. That is why she finds herself manipulated into becoming the newest recruit for Sparrow School, a secret intelligence service that trains exceptional young people like her to use their bodies and minds as weapons. After enduring the perverse and sadistic training process, she emerges as the most dangerous Sparrow the program has ever produced. Dominika must now reconcile the person she was with the power she now commands, with her own life and everyone she cares about at risk, including an American CIA agent who tries to convince her he is the only person she can trust. Red Sparrow is in theaters on March 2nd, 2018. The first time I saw Jennifer Lawrence, she was sawing off an arm in Winter's Bone, giving me fodder for my "now TWO of this year's Best Picture nominees involve amputation" joke. James Franco's character removed his own arm in 127 Hours. Then there was the scene in Winter's Bone. They were both nominated for Best Picture. I guess it was more of an observation than a joke. We've since seen her take on a multitude of various roles, one of which earned her an Oscar. There is no question that Jennifer Lawrence has killer chops. I see in her the likes of Natalie Portman, Michelle Pfeiffer, and Sally Field. With just a touch of Jack Nicholson. Lawrence can be dropped into any film and increase its value by being there. Passengers was a remarkably sub par film that I was able to endure because of her prowess. Mother! -- one of the most polarizing films of the last decade -- was enriched by her on-screen magic. 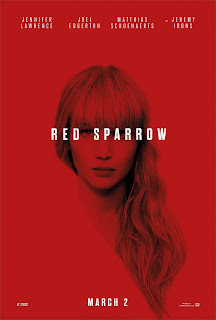 And now, Red Sparrow, a film that promises intrigue and espionage and delivers next to nothing, is saved merely by her presence. When Prima Ballerina Dominika Egorova's (Lawrence) dance career is cut short, her life is turned upside down in short order. To care for her ailing mother, Dominika takes on a sort of assignment from her Uncle (Matthias Schoenaerts) who promises that she'll get everything she needs upon completion of this task. Dominika is sent off to Sparrow School wherein she will learn the ability to manipulate people using her body. Dominika takes on various identities while attempting to get close to CIA agent, Nate Nash (Joel Edgerton). When she learns that Nate spends his afternoons at the pool swimming laps, Dominika decides to catch his eye by dying her hair. Ladies and gentlemen, the movies often ask us to suspend our disbelief. That said, watching her character -- who has long, chocolate locks -- walks into a drug store and picks up one box of blonde hair dye. Even if she'd purchased eight boxes, you don't go from dark brown to blonde from a box. Then, she goes to the pool with her newly natural-looking lighter shade and dives into a chlorinated pool. In real life, her freshly colored tresses would have turned GREEN. I had several problems with Red Sparrow, but that one was at the top of the list. One of the greatest struggles Sparrow faces is its quest to be a forward-thinking masterpiece in regard to the empowerment of women. Lawrence's lead is a very strong woman, indeed. The film falls flat, however, in attempting to follow too many plot lines. 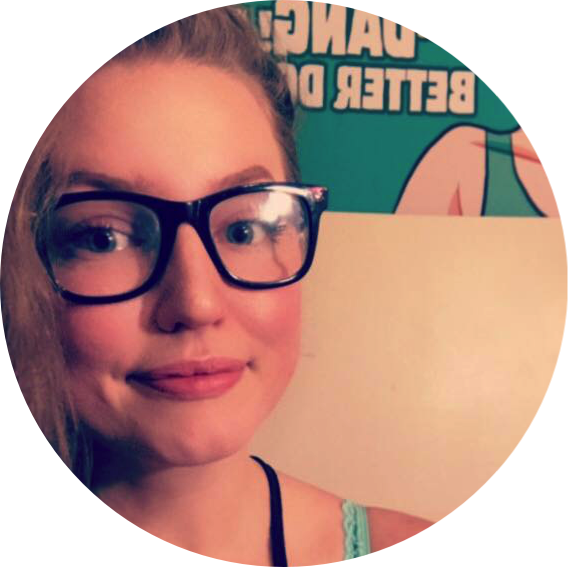 I'm also not on board with the fact that our "leading lady" is to be the hero -- in a way -- but Nate the white American sort of steals her thunder. But isn't that just the way of the world? The film is flawed at best, but Lawrence performs brilliantly, giving us a sort of light at the end of the tunnel. I normally would never post any kind of spoiler in a review of a film, but I would be remiss to omit the detail that there is a rather jarring sexual assault scene in this movie. For director Francis Lawrence -- no relation to Jennifer -- this film appears to be new territory as his previous projects were the Hunger Games films, Water for Elephants, and music videos featuring Beyoncé, Lady Gaga, and Britney Spears. Perhaps the film's lesson in letting go might apply to him, as well.